The Argentinean Foreign Ministry has asked Russia to arrest and extradite Ali Akbar Velayati. former Foreign Minister of the Iranian regime, for his role in the 1994 bombing of a Jewish community centre in Buenos Aires that killed 85 people and injured 300. 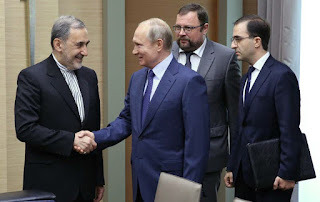 Velayati, now a top aide to the Iranian regime’s Supreme Leader Ali Khamenei, arrived in Moscow on July 12 to meet with President Vladimir Putin, and was due to travel to China on July 13. Argentina's Foreign Ministry said in a statement that they had not yet received a response from Russia, but that they had made the same extradition request to China. Velayati was the clerical regime;s Foreign Minister, when a bomb destroyed the headquarters of the Argentine Israelite Mutual Association on July 18, 1994, which was the biggest terrorist attack in Argentina's history. The Argentine prosecutors described Velayati as one of the "ideological masterminds behind the attack", along with former President Akbar Hashemi Rafsanjani, who has since died, and former Islamic Revolutionary Guards Corps Commander Mohsen Rezaie. Velayati has been charged him with murder, with the addition of a hate crimes statute because the attack was designed to target Jewish people specifically. It is worth noting that another diplomat of the Iranian regime was recently arrested in Germany for his role in the plot to bomb an Iranian opposition rally in Paris on June 30. It is believed that Assadolah Assadi, a diplomat at the Iranian embassy in Vienna, will be extradited to Belgium to face the terror charges.